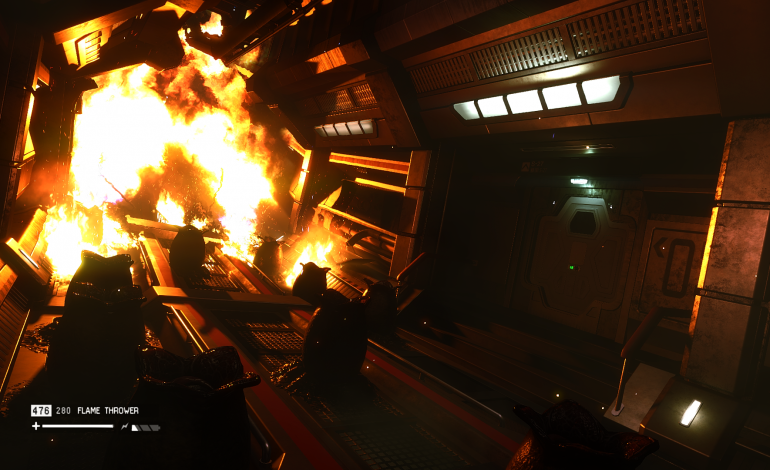 The Creative Assembly’s Alien Isolation, released last October, has been hailed by many as one of the most terrifying survival horror games ever made. It was also our game of the year. However, did you know that once upon a time, it was experimented with as a third person survival horror game? The game has a dramatically different feel in third person than its current first-person format, closer resembling more familiar survival horror titles like the most recent Resident Evil games and The Evil Within, which was released in the same month as Isolation. What’s also plainly evident is that it isn’t as scary. The game’s claustrophobic metallic corridors seem more spacious, and avoiding the xenomorph has a more methodical, strategic feel because of the cover-based mechanics. It’s also interesting to note that Amanda Ripley has a different look in this early build. At the panel, Hope talked about how the team sought to take more cues from popular third person survival horror games like Resident Evil 4, Dead Space, Clock Tower and Silent Hill 2, but decided to stick with the first-person perspective after some experimentation. In third-person, you have too much information. Your character is hiding behind a desk, but the camera is up above and you see too much. You know more than the alien does. The fact that you can’t see stuff in first-person really drives you crazy. As many will agree, this design choice most likely played a big factor in Alien Isolation‘s success, and the game remains one of publisher Sega’s best selling titles at the moment, and a new flag bearer for both the survival horror genre and the Alien franchise. The game has also recently gotten its fifth and final DLC pack, The Trigger, which comes with three survivor mode missions.